She's set to reprise her role as Lady Mary Crawley in the forthcoming Downton Abbey film. 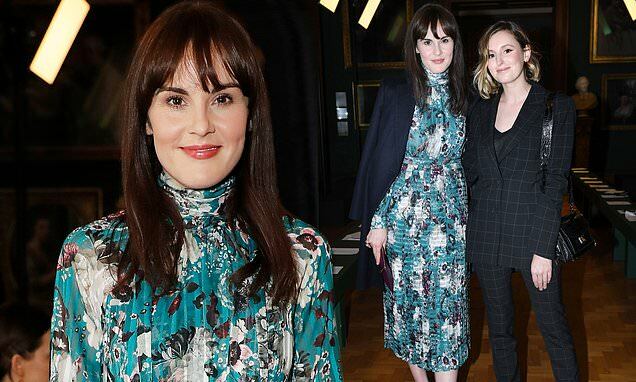 And Michelle Dockery appeared in great spirits as she reunited with her co-star Laura Carmichael - who plays Lady Edith in the period drama - on the FROW at Erdem's A/W19 showcase during London Fashion Week on Monday afternoon. The Hanna actress, 37, displayed her eye for style as she slipped into a teal turtleneck midi dress, embellished with floral patterns and pleated detailing throughout. Upping the fashion ante, the Good Behavior star boosted her physique in a pair of pointed silver heels, and draped a navy coat over her shoulders. Tying in with her sophisticated display, Michelle wore her full fringe 'do sleek and straight, while opting for rose-tinted make-up. Meanwhile, Marcella star Laura, 32, nailed androgynous chic as she rocked a skinny checked pantsuit, teamed with a low-cut scoop top. Turning heads with her quirky display, the blonde shunned glamorous heels in favour of patent black brogues.